This is all Mom…though sometimes she cooks hers exclusively in the oven. The thing with stew is that it’s a lot like soup, here’s the outline, add to or take away from as needed, this is just how I happen to like it. 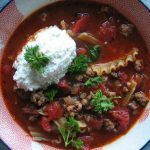 If you would prefer the oven method, combine everything (raw beef, remember salt and pepper) in a large, oven-proof pot with a lid and cook at 300 for about 5 hours, then remove some of the liquid to make a slurry with a bit of flour and add it back to the simmering pot, on the stove, to thicken it up. Dumplings are up to you. I made this last Wednesday and had it all ready before soccer, but I was juggling a few things so it simmered for a couple of hours and also went into the oven for a couple of hours. Thursday was leftovers, Friday we had a do-it-yourself sushi night and Apple Crisp, Saturday the girls and I did pizza and a movie and last night was baked fish, yam fries and cut up veggies – tonight was Chicken Pot Pie. There’s been more leftovers than usual, but they make lovely warm lunches with weather like this. In a large, oven-proof pot (with a cover), saute the beef in batches, with a bit of oil and a good sprinkling of salt and pepper until the beef is no longer pink. Remove the beef and reserve on a plate. Add the finely chopped onion, garlic and rosemary to the pot and saute until all is softened, then add in the flour (if using the stove top method) and cook while stirring until the flour is no longer visible. Slowly add in 2 cups of broth and continue stirring until the mixture comes to a boil and starts to thicken a bit. Add in the tomatoes, onion, celery, carrots, and potatoes and then add the beef back in, give everything a good stir and add more broth to barely cover everything. Simmer (or put in the oven at about 300) for 3 to 5 hours – you can easily turn up the heat to move things along if you need to, but stir it regularly! It probably won’t appear to be very thick, but the dumplings assist with this. Whisk together the 3 dry ingredients, cut in the butter as you would with pastry, then stir in the milk. 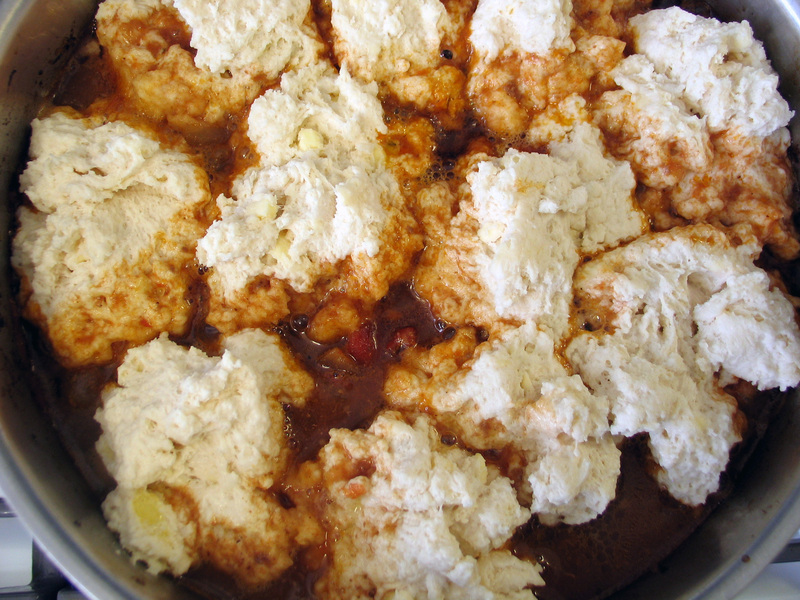 While the stew is gently simmering on the stove, drop the dumpling mixture in good-sized spoonfuls evenly across the top of it all. Leave them to cook for about 15 minutes and then put the lid on and simmer for another 15 minutes or so. Check them, you can’t really overcook them, but underdone dumplings wreck everything. Serve as you would – we enjoyed this straight up in big bowls – and as I mentioned, the leftovers are great.